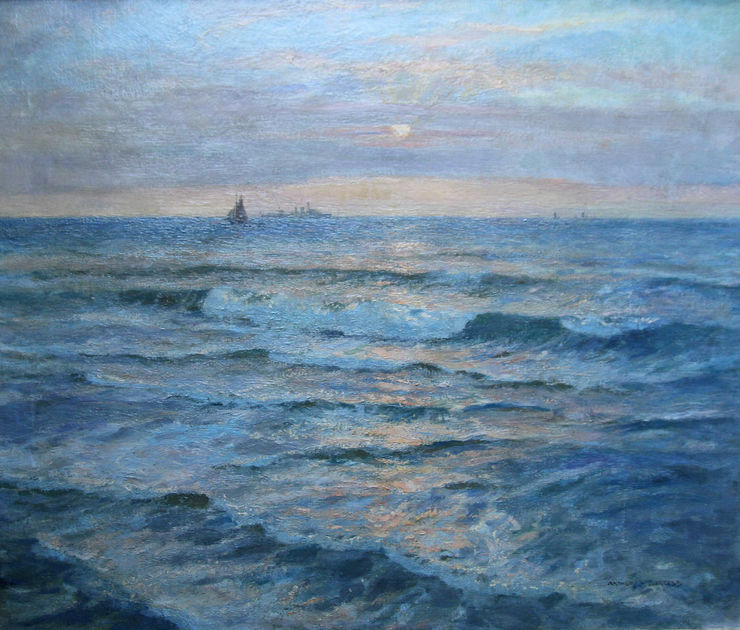 Sunset seascape with sailing boat and battleship on the horizon. 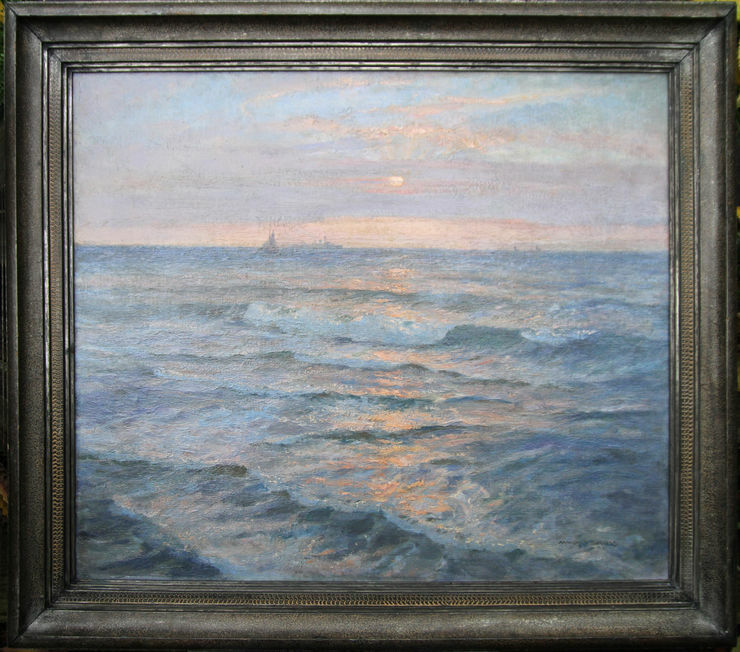 Painted by the Australian artist Arthur James Wetherall Burgess who was taught by Julius Olsson in St Ives. The influence translates to this painting. Looks like one of Olsson's large St Ives seascapes. Signed right. Swept frame 40 inches by 30 inches. Arthur James Wetherall Burgess (1879-1957). Born in Australia, his father was an officer in the Australian Navy and, being an artist himself, encouraged his son to draw from an early age. He attended schools in New South Wales and Tasmania, and trained for three years in an architect's office, spending all his leisure hours sketching ships in Sydney harbour. Just after his 21st birthday he emigrated to England. In November 1901 he signed into St Ives Arts Club as a guest of Julius Ollson and later became his pupil. The registers show he visited again in January 1912 and November 1914. Tovey includes a coloured plate of his painting, Drifting Home, St Ives, in his social history of the St Ives artists (p243) and another, Rowing Boats in a rocky cove (p244). During the War he became Official Naval Artist for the Australian Government. In WWII he was commissioned by various shipowners to paint their merchant ships and convoys in ports all over the country. Having made rough sketches, he returned to his studio in Ludlow to complete the finished pictures (his studio in London having been bombed in the Blitz). His wife, Muriel Burgess (nee Coldwell), was a pupil at the Forbes School whilst copying her father's portrait in 1936-37.